Please indulge a bit of commentary before we dive into the collection. 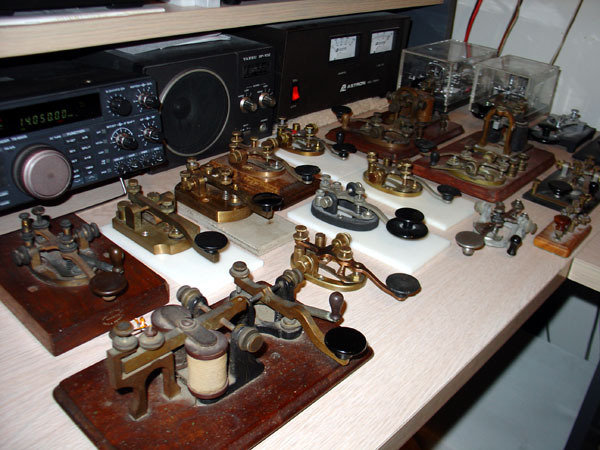 As a lover of all things Morse Code, collecting telegraph keys, sounders, paddles and bugs has been a natural extension to my Amateur Radio exploits. The instruments below are more than show pieces collecting dust on a shelf. Each is used on the air, regardless of age. My philosophy in collecting older telegraph instruments has always involved soft restoration. i.e., general cleaning and repair to make them functional, but keep them in their as-found condition. As with all antiques, taking a wire brush to brass in order to ‘shine it up’ is blasphemy in this shack. As such, some of these keys have quite a ‘patina’ built up and truly show their age. It’s sad to see some of the scorched specimens offered for sale on places like E-Bay where antique keys and sounders have been polished to the point they look new. I truly believe these people are destroying these pieces of history. I refuse to buy from these vendors (Mr Green background as an example), and hope you do the same. This page is a work in progress. I have over 50 keys and sounders that I want to document with high resolution photos. Please check back often as I will be adding additional keys in the coming days and weeks. Thanks for visiting! And please don’t hesitate to tell me what you think.. or if you’d like to see something highlighted.